CHICAGO, IL--(Marketwired - August 08, 2016) - The Illinois Technology Association (ITA) is thrilled to announce the 39 finalists being recognized at the 17th annual CityLIGHTS Awards. The winners for each category, with the exception of the CityLIGHTS Industry Champion, are determined by a compilation of the judges' scores and voting by the public at large. You help decide the winners! Voting is now open through Friday, August 19 at itacitylights.com. "The rockin' tech companies and leaders selected by this year's CityLIGHTS judges, without a doubt, showcase the high caliber of tech in Chicago," said ITA CEO Fred Hoch. "Year-over-year we have seen that the CityLIGHTS Awards is a barometer for success in the community, often predicting who or what will be the next big thing. I can say with confidence that this year, with these finalists, we are setting the stage for tech greatness for years to come." 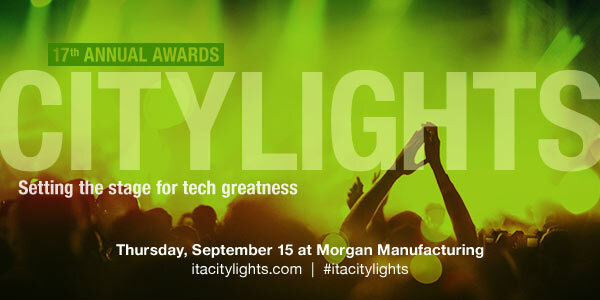 Find out who wins by attending the ITA CityLIGHTS Awards ceremony on Thursday, September 15 at Morgan Manufacturing in Chicago. Tickets and tables are available for purchase at itacitylights.com or contact Kelly Faso at kelly@illinoistech.org. Thank you to all of this year's sponsors, Armanino, Grant Thornton, Hyde Park Angels, Liquidus, Madison Dearborn Partners, Silicon Valley Bank and Southpoint Insurance, as well as our event partners, Clique Studios and Jewell Events Catering. The Illinois Technology Association (ITA) scales Illinois tech companies. With innovative resources that allow members to collaborate with each other, build their talent networks and elevate their local and national presence, ITA is the region's strongest advocate for fostering innovation and growth. Founded in 2005 and supporting 500-plus growth-stage tech companies, ITA has a rich history of driving the business forward. For more information, visit illinoistech.org, follow @ITAbuzz on Twitter or find us on LinkedIn.